Taipei Taiwan’s Yongkang-Shida Commercial Area is home to three unique Birkenstock shops. Yongkang Commerical Area used to be a neighborhood for Japanese officers during the period of Japanese colonization. Over the years the neighborhood has accumulated a unique humanitarian atmosphere. Besides renowned delicacies, the area also boasts special architecture and boutiques. Shida Commercial Area is famous for Shida Night Market. 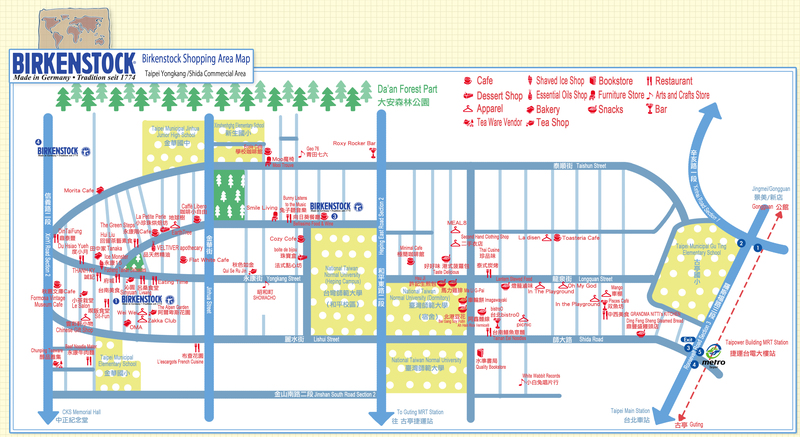 In this area, you will find Taiwanese feature snacks, trendy and fair-priced apparel, and exotic foods. These two areas are a great attraction for tourists. You can download our adorable shopping map and explore this area with the characters in Birkenstocks Common Language for Travelers.